These two subjects can sure elicit some strong opinions in pediatric ophthalmologists. Let’s go over some basic concepts so that you can be better informed about these difficult to understand conditions and hopefully, have a more productive conversation with your child’s ophthalmologist. There are few topics that are as emotional for parents as the well being of their children so please don’t be afraid to ask your child’s doctor questions. Don’t be timid to seek out second opinions either. The last thing any parent wants to feel is that they didn’t do all that they could to make their child’s vision better. A word about some basic terms. 20/20 refers to “normal” visual acuity or vision. If you have 20/40 vision uncorrected, this means that what a “normal” person sees at 40 feet, you see at 20. 20/200 uncorrected means that what a normal person sees at 200 feet, you see at 20 feet. Pretty bad right? I have a lot of patients that have 20/2000 uncorrected vision! This means that what I see at 2,000 feet, they see at 20 feet.Legal blindness is defined as 20/200 or worse in the better eye while wearing glasses or contacts. I hear folks with high glasses prescriptions say that with the glasses off, they are legally blind. Technically, this isn’t correct since legal blindness is defined with glasses on, not off. Now, let’s start our discussion of amblyopia and strabismus. The nerve hook-ups between the eyeball and the brain are not fully developed when we are born. Our eyes need clear, centered images on both retinas in order to have our brain develop our maximal visual acuity and depth perception. (Depth perception is also called stereopsis). If your child’s retina does not receive clear images (blurry from an unmet need for glasses), has exotropia (wall eye) or esotropia (cross eye) or, worse yet, a cataract or corneal opacity, your child will not develop his/her full visual potential. This lost potential visual acuity is calledamblyopia. If the defect is not remedied by the age of 5, the lost potential visual acuity will be much more difficult to fix. By 10 years of age, not much can be done to improve the child’s amblyopia. 2% of the population, kids and adults, have amblyopia. One half of school age children with amblyopia have amblyopia with a visual acuity of 20/80 or less. This is significant as the visual acuity cut off for driving in most states is 20/40 in the better eye, so these people have lost driving visual acuity in one eye, potentially forever. (Patients with vision of 20/40 vision or worse in one eye are considered functionally “one eyed” and should wear polycarbonate lenses at all times to protect the remaining good eye). Amblyopia results from two main entities. Strabismus accounts for 50% of cases and most of the rest are from an unmet need for glasses. Cataracts or corneal scars occurring before 30 months of age are a rare cause of amblyopia, but when it occurs, it results in profound visual loss, typically in the legal blindness range. It is much harder to treat as well and can result in nystagmus. (Nystagmus is the full time rhythmic rocking of the eyes back and forth.). When cataracts or corneal opacities develop early in life, a more severe form of amblyopia will frequently develop which is much harder to reverse. In fact, the earlier the onset, the worse the amblyopia. With cataracts and corneal opacities, the earlier cataract or corneal opacity is corrected with surgery, the better the final vision will be. Currently, cataracts at birth (congenital cataracts) are being removed within the first 1-3 months of age with significant improvement in visual acuity. If your ophthalmologist is not willing to perform cataract surgery at this early of an age, seek out a second opinion. Remember, you are your child’s primary lobbyist. They rely on you to do what is best for them. As a disclaimer, I do not personally perform these surgeries on children. There is a mild form of amblyopia known asmonofixation syndrome(also called micro-strabismus). My favorites method of diagnosing monofixation syndrome is with the worth 4 dot test. This test involves looking through glasses with a green lens on one eye and a red lens on the other, then looking at a flashlight with 4 lights in its face. 2 green, 1 red and 1 white. Up close, most everyone sees all 4 lights. Once I move the flashlight 15 feet away from you, some of the lights will disappear if you have monofixation syndrome. Many adult patients that cannot be corrected to 20/20 with glasses have monofixation syndrome. They have had it all of their life and never knew it! In a number of patients, I am the first doctor to diagnose it. Diagnosing this in adulthood means that, like other forms of amblyopia, nothing can be done to improve the vision but it does give us a reason as to why you are not seeing 20/20. 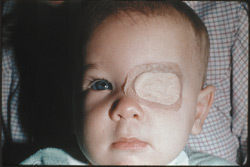 The treatment of amblyopia involves obtaining a clear image on the retina of the eye or eyes involved with glasses (and/or cataract or corneal opacity surgery) and the patching (occlusion) of the better eye so that the brain’s suppression of the amblyopic eyes impulses to the brain is overcome. Patching is best done by 5 years of age but I have had improvement in vision with patching up until age 10. After 10 years of age, not much can be done to improve the child’s vision and the child is stuck with reduced vision for the rest of their life. This is why screening by pediatrician’s offices and the schools are so important for identification of children at risk. Patching is always done with glasses on if they are needed. Patching ranges from occluding the good eye part of the waking day to “all waking hours” occlusion. 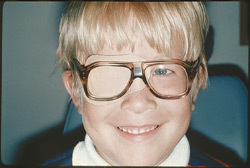 Typically, the good eye is patched one week for each year of the Child’s life. For example, a 6 year old child would need 6 weeks of patching in order to see if patching the good eye will improve the vision in the amblyopic or bad eye. While there is some debate over patching “all waking hours” versus only some of the day, you don’t know if patching has failed until “all the waking hours” patching has failed. Strabismus is the misalignment of one eye when both eyes are trying to look at an object. The common terms used to describe strabismus include wall eye (one eye going out towards a lateral wall) and cross eye (one eye looking across the nose). Lazy eye can be used to describe amblyopia or strabismus depending on who you talk to. 50% of patients with strabismus also have amblyopia at the time of diagnosis, so the two conditions frequently need to be discussed together. Surgery is done to try and get the eyes aligned better. It is done mainly for cosmetic reasons but this is a very important and legitimate reason to do surgery in today’s society, especially in children. If possible, amblyopia should be corrected before strabismus surgery is performed as good vision in both eyes may help keep the eyes straight after the strabismus surgery. Strabismus surgery is less successful the more times it is repeated on a patient’s eyes.